You are currently browsing the tag archive for the ‘kids christmas pajamas’ tag. Skivvydoodles and Sara’s Prints Christmas pajamas will be arriving soon. Please check back with us at the end of this week or the beginning of next week. Skivvydoodles we will have one print with both pajamas and nightgowns in sizes 2T to 14 years. Sara’s Prints Christmas pajamas will be in the footie and two piece pajamas. We will have two prints to pick from in Sara’s Prints Christmas pajamas. Be sure to check back with us. Twenty four shopping days left until Christmas. Be sure to have all your matching family pajamas for your Holiday pictures. The Lazy One Snowed In Matching Family pajamas are a great choice for those morning pictures. Lazy One Snowed In Matching Family Pajamas come in sizes 6 Month to 18 Month for infant pajamas. Size 2T to size 10 years for kids pajamas and woman pajama sizes X Small to X Large. Adult Unisex sizes X Small to X Large. The Adult unisex pajama sizes run bigger than the woman sizes, just FYI. If you have any questions about sizing please feel free to email us at customerservice@mybabypajamas.com or call us at 480-330-6380. We take phone calls until 7 pm PST. It’s almost Thanksgiving and just around the corner is Christmas. Now is the time to buy your infant Christmas pajamas while supplies are in stock. My Baby Pajamas has two different footie Christmas pajamas to choose from: Skivvydoodles Red Snow Daze Christmas Footie Pajama and the Skivvydoodles Blue Snow Daze Christmas Footie Pajama. We also have the matching kids pajamas and girl Christmas nightgowns for the older kids. If you are looking to match the whole family in matching family Christmas pajamas, be sure to check out the Lazyone family pajamas. In the infant Christmas pajamas by Lazyone, we have the Lazyone Snowed In Infant Pajamas for Boy and Girls and the Lazyone Classic Red Moose Infant Pajamas for Boys and Girls. Be sure to check out all our Christmas Pajamas! My Baby Pajamas has received our Skivvydoodles Blue Christmas Pajamas for this holiday season. We have two prints to choose from and they are going fast already! The Skivvydoodles Blue Stripe Applique Nightgown for girls in great for the holidays and it has a matching pajama set. 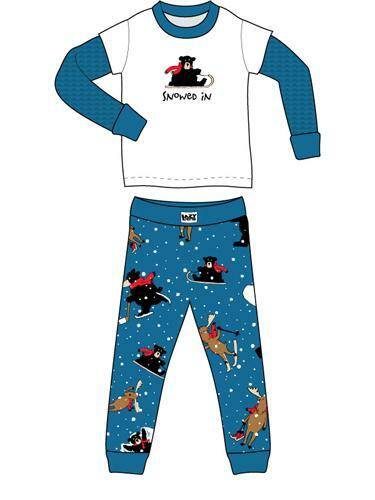 Also, the Skivvydoodles Blue Snow Daze Pajamas are great for this holiday season. The print also has a matching girl nightgown and the footie. The pajama sets and nightgowns come in sizes 2T to size 14 and made to fit loose. The footie pajama comes in size 12 Month to size 24 month. We also have both these prints in red! Shop now for all your kids christmas pajamas. Are you looking for family matching pajamas for the holiday season? Maybe for that special family picture on Christmas morning…well look no farther. My Baby Pajamas has a few different prints and styles for family matching pajamas. Be sure to check out the Lazyone Snowed In Pajamas for the family. These are becoming a big hit this holiday season. My Baby Pajamas has the infant pajamas, kids pajamas, woman pajamas and adult unisex pajamas for dad! Lazyone family pajamas are made from 100% cotton and fit great! Great Kid Pajamas at a Great PRICE! Are you looking for great kid pajamas at a great price? Well, look no farther…My Baby Pajamas has a great line of kids pajamas and they are priced to sell at $23.99. Lazyone pajamas are made from 100% cotton and wear great! 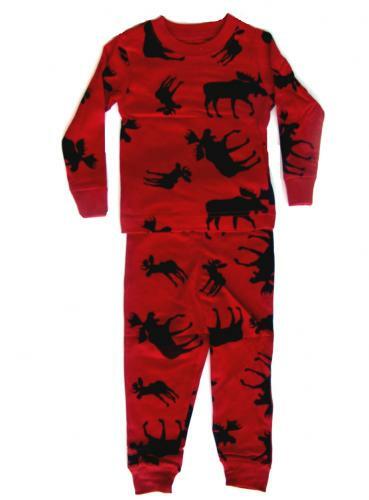 With Christmas and the holidays just around the corner be sure to check out the Lazyone Classic Red Moose Kids Pajamas. They come in sizes 2T to size 10. Also, another great thing about Lazyone kid pajamas is that the shirt runs long. We just love that! Another popular print in kids pajamas are the Lazyone Lobster Kid Pajamas. They also come in sizes 2t to size 10. These prints are great for boys pajamas and girls pajamas. Don’t forget all Lazyone kid pajamas are just $23.99. Happy Halloween from My Baby Pajamas. In honor of Halloween, My Baby Pajamas is having a one day sale. Save 10% off your entire order, this includes sale items also! That’s a savings of up to 50% off select items. Shop for your kids Christmas pajamas now and save 10% off your kids Christmas pajamas and family matching pajamas. This is a ONE DAY SALE. It’s that time a year again. Time to start thinking Christmas pajamas. My Baby Pajamas is starting to receive our Fall Collection of pajamas now. Also, you can pre-order your Lazyone Family Matching pajamas for Christmas/Holidays. Lazyone is bring back their best seller from last year, Classic Red Moose. You can order infant sizes through adult. Also, Lazyone has introduced a new print, Snowed In. I believe this print is going to be a hit so order NOW. Delivery date is not until mid October. You can order online with your other pajamas or you can order over the phone and we will not charge your credit card until your order ships. Please call us to order at 480-330-6380. Sizes for both prints are infant sizes 6M, 12M, 18M. Kids sizes 2T to 10 Years and adult sizes. The Classic Red Moose for adults is a unisex style for both men and women. The Snowed In print has both women and men styles. Be sure to check out the new Christmas pajamas. Matching Family Pajamas or NOT! Matching Family Pajamas are big sellers during the holiday season. I tried to have my family select matching family pajamas but the boys threw a fit (including my husband, who is taking the pictures). So I let everyone pick out their favorite pair of Christmas/Holiday pajamas and you know what…I like the picture of all the different brands and styles. It shows all of our unique taste and style. Having matching family pajamas is good (if it works) but having everyone happy is better! My Baby Pajamas is having a two day SALE Thursday 11/26 and Friday 11/27. Save 20% off your entire order when you use the code THANKS in view cart before checkout. Jack is wearing Hatley Winter Wonderland Pajamas sizes 2T-7 years. Anthony is wearing Papabear Snowman Flannel pajamas sizes 2t to XXL Adult. I am wearing Hatley Polka Dot Flannel Women Pants and Hatley Polka Dot “Merry X Moose” tee.